It is the Hot Tamale Train of the spice world (for those of you who this metaphor was lost on…please refer to So You Think You Can Dance clips or just forget about it). This week, I have had ginger three different ways in three different days. Um–excuse me, mind on the baking if you please. The holidays just seem to ooze ginger. And I want to know what on earth says Christmas better than sitting down with the fam and friends for a messy, flour-sprinkled gingerbread baking marathon? That is exactly what we had yesterday. My kitchen was literally covered in molasses, flour, spices and cookie cutters. As we painted cookies, I witnessed fingers being licked with joy, creative juices flowing, kids’ eyes sparkling and smiles wide open. These kids I am talking about range from twelve to seventeen and the biggest kid of the bunch was my husband who was piecing together three-D reindeer cookies. He carefully “sanded” down each joint so that they would fit together with a little royal icing spackle so the reindeer could stand freely. The Rudolph is courtesy of my daughter. Aren’t they adorable? A little rustic perhaps, but at this house we are never going for perfection when we are baking and having fun. The emphasis is ALWAYS on HAVING FUN! We have had ginger crinkle cookies (see top photo), gingerbread cookies and this morning, the crowning glory…my fave of the bunch…was gingerbread pancakes. Oh yeah. 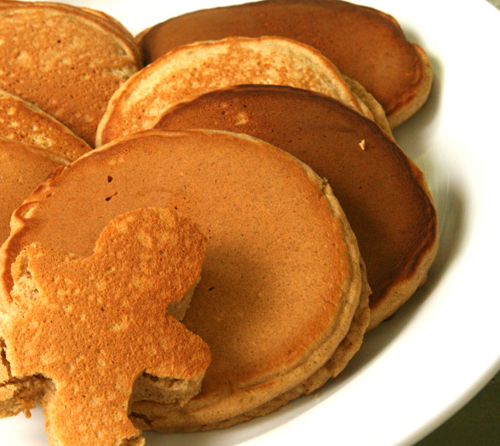 I said it…gingerbread pancakes. You can catch your breath if you like. They are soft, spicy, fluffy and absolutely everything you have ever wanted in a pancake and more. It would blow the minds of any breakfast guests…especially served with a big dollop of ginger spiced whipped cream alongside a hot cup of coffee doused with a hint of eggnog. Ooooh. La. La. I am nothing if not a giver here because I am not just going to hoard my pancake recipe, I am going to share it with you so you can have them next weekend. See? Give, give, give. Anyhow, back to the three ways with ginger. My ginger crinkle cookies are beautifully fluffy and soft so no crunch factor in those, unless you count the little dust of granulated sugar they are coated in, but the gingerbread, well those are the perfect lightly crisp type of gingerbread (especially if you don’t let them bake too long!). So have fun with these, and I challenge you to have ginger three ways in three days! Let me know how it goes! In a large mixing bowl, whisk together the flour through the brown sugar. Now get your griddle or large frying pan ready by putting a pat of butter and capful of canola oil onto your griddle or pan. Turn the stove on medium heat and grease your pan with the combination of butter and oil. Soak up excess oil with a paper towel (do not get paper towel anywhere near flame…obviously). The pan needs to heat up for a good five minutes before cooking the pancakes. In a separate bowl or large liquid measuring cup, whisk together milk, molasses, eggs and oil. Add the liquid ingredients to the dry ingredients all at once whisking only 10-15 times so that batter is just combined but there are still some lumps. Over mixing will cause the pancakes to be tough. Ladle pancake batter onto pan. Cook on the first side until bubbles start to form on the batter or take a peek with your spatula and flip it when it begins to look brown/golden. Cook another minute or two until pancakes look done. Do not press your spatula on top of the pancake, thinking that will help it cook all the way through. This would eliminate air pockets and thus create a denser, tougher pancake. That is not what we are going for here. If you would like to serve it with ginger whipped cream, click the link. Preheat oven to 375 degrees F. Grease several baking sheets by coating with cooking spray or use Silpat mats or parchment paper. In a medium mixing bowl, thoroughly stir together the flour through the cinnamon; set aside. 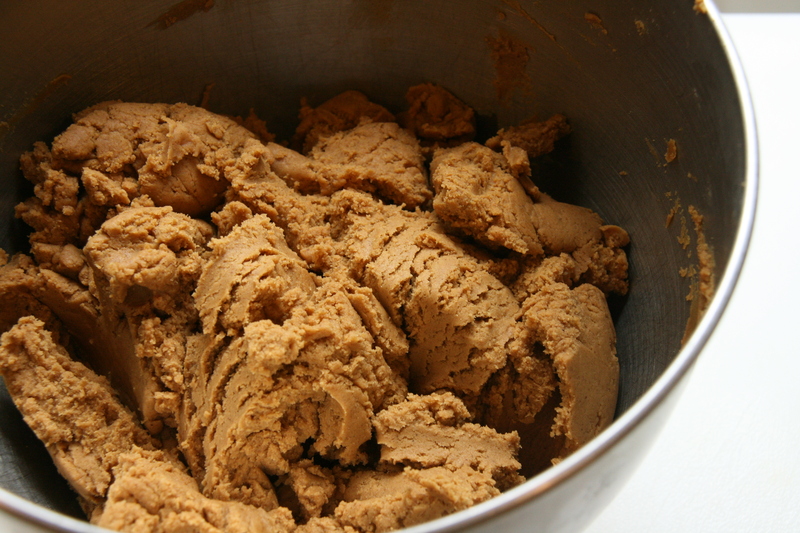 In a large bowl, with an electric mixer on medium speed, beat together the butter, shortening, brown sugar and molasses until well blended and fluffy. See below. Beat in the egg and orange zest until well blended and smooth. Beat in half of the flour mixture until evenly incorporated. Beat or stir in the remaining flour mixture until evenly incorporated. Let the dough stand for 5 minutes or until slightly firmed up. 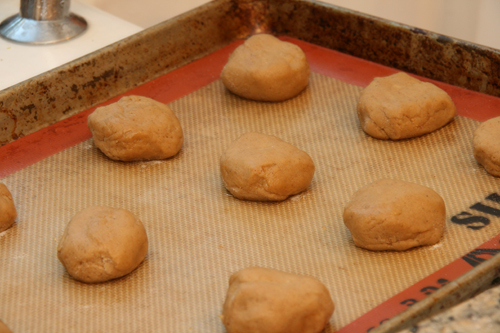 Shape portions of the dough into generous 1 inch balls with lightly greased hands. I usually just lightly spray my hands with cooking spray. Roll each ball in the the sugar until lightly coated. Place on the baking sheets, spacing about 2 inches apart. Using your hand, lightly pat down the cookie tops just slightly. Bake the cookies, one sheet at a time, in the upper third of the oven for 10 minutes or until barely firm in the centers and faintly browned at the edges. Cool on the pan for 5 minutes and then transfer to a cooling rack. Store in an airtight container for up to 3 days or freeze for up to a month. 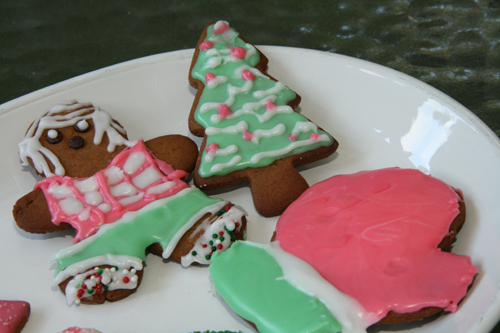 Click this link for Gale Gand’s Gingerbread cut out cookies. Those are so cute and delicious! Nicely done! Hi, Geni. Of course, I remember Ginger from “Gilligan’s Island”! Way up there with “The Jetsons”, “The Flinstones” “My Favorite Martian”, “Mr. Ed”, and “I Dream of Jeannie”, for bizarre pre-reality-show TV. But I also like ginger in dishes sweet and savoury, and our cat from Vanuatu is named “Jinja”, so there you have three more ways of ginger…. Fun post, entertaining, and useful. P.S. I forgot to mention that I have “Mary-Ann’s ‘Gilligan’s Island’ Cookbook”, by Dawn Wells, if you can imagine that….a gift from a friend years ago. There is actually a very good punch recipe in it, “Lovey’s Punch”. You will have to post “Lovey’s Punch” someday. I will be looking for it. Rudolph is so cute. Ginger is my favorite flavor. I can never get enough of it. These three-d reindeer cookie cutters are so fun for the kids (and husband), but they use up a lot of dough! Wow! These look awesome!! Gracie has been wanting to make gingerbread cookies. Maybe we’ll give these a try when we are in Texas!! What a perfectly timed post! I was just listening to an interview with Chef Ming Tsai on NPR last night (nerd alert! ), and he was going on and on about how ginger is the perfect ingredient in his opinion. So, he started my ginger craving, and you have now given me the tools to satiate it. I’m a pancake girl, and those ginger cakes are calling my name! Who isn’t a pancake girl, and if they aren’t, well then more for us! Hope you enjoy. i really love rudolph:) very cute and festive!! great post Geni. 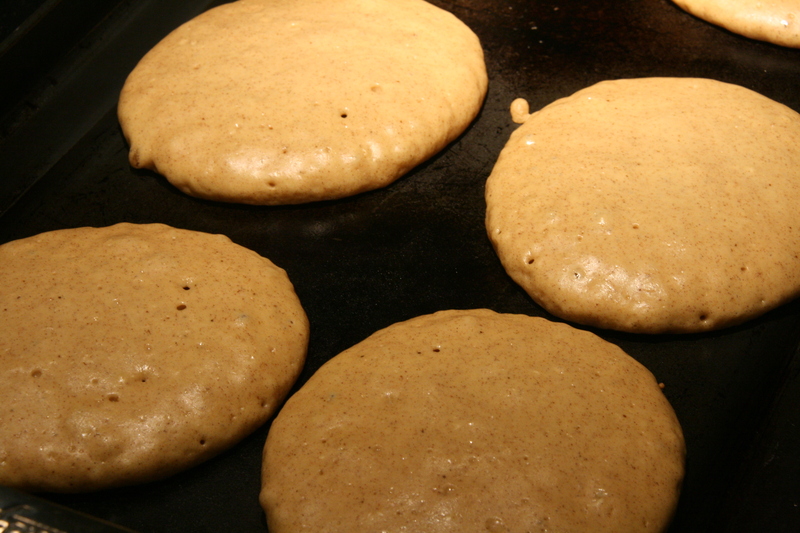 Gingerbread pancakes? Thats the best idea ever! Those reindeers are the cutest thing ever. 🙂 Your husband did a fantastic job of putting them together. Blackboook Kitchen Diaries – My daughter was thrilled that you liked it. Leah – Oh how I wished you didn’t live so far away in Canada…I would seriously have you over for breakfast. Juliana- Try them and let me know how it goes! Anderson – I will tell him. He is a perfectionist and was not happy with how they turned out. 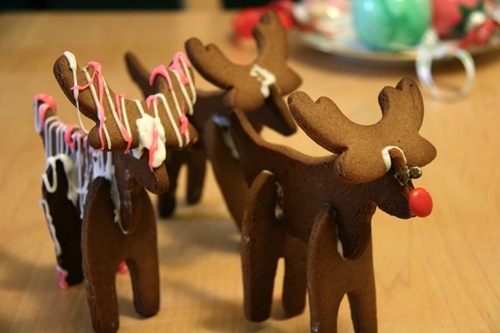 EZ Recipes – Thank you, my daughter is happy with all the nice comments about Rudolph. The Rudolph cookie is adorable. 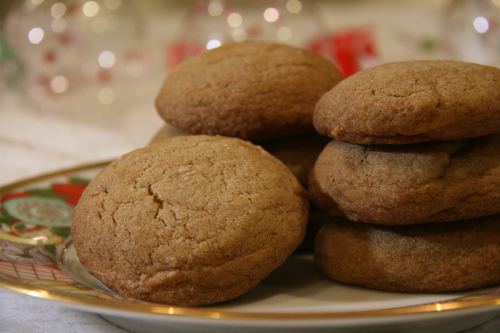 And ginger is definitely a delicious classic for Christmastime. Fun cookies! Thanks Zoie! I love your Rudolph! Linds – cool new special effect on my WordPress dashboard! I have been looking for ginger cookies recipe since this past Xmas I bought the store bought mix and everybody loved them! So, thank you, they look very goood!